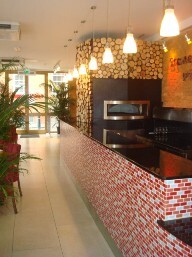 From London to Brussels: two Lifestyle brands within big Hotel Groups: two different concepts. This past June, I was on a business trip to London & Brussels and stayed in two hotels which belong to Lifestyle brands that I wrote about in this blog. Both Indigo by IHG (Intercontinental and Crown Plaza, among other brands) and Aloft by W (Starwood) have created a different approach to boutique or Design Hotels but within an affordable mid-range market. Indigo has developed at a faster pace giving more freedom to independent owners to express their individuality, while continuing to have brand standards in designing a hotel. Aloft has created a very defined design and operational platform in which owners want to get a “ready in the box” product. I stayed at the Indigo Tower Hill in London. I always stay in the West End and staying in the “City” was not so comfortable. But the reality is that there are many business travelers who have business to attend to in this area and tourists who want to be close to Tower Hill and London Bridge. In any event, I felt like I was in Tel Aviv. The front desk clerk that attended me was Israeli and the hotel owner is an Israeli that owns Thai restaurants in London. This Indigo hotel was small and intimate, and had very well designed rooms in terms of lighting, storage space, a great bed, good working station, a lot of mirrors and big shower head. I must say, though, that the actual design of materials, colors, textiles, and use of murals on walls was a bit too crowded for my taste (too much going on…). The Indigo concept requires creating a neighborhood story and having the hotel relate and respect its surroundings and representing it in the design of the hotel. It does leave a lot of room for owners to create their own design. It’s great that the hotel offered free WIFI and access to a nearby fitness center. 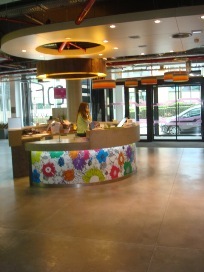 I stayed at the Aloft in Brussels, the first Aloft to open in Europe after development of the brand in the USA. This brand competes with Indigo, but it is interesting to see how completely different the two brands are. The Aloft concept is pre-designed and franchised to owners with strict requirements that enables the brand to be protected and be recognized by many. Aloft a “colorful fun box” of surprises that really makes the guest stay more playful. The brand starts this friendly relationship with the guest by interacting with him through social media and inviting him to get acquainted with hotel through Facebook before he actually arrives. And, of course, guests can purchase additional amenities and products, and enjoy activities like theme parties in the hotel’s courtyard. Fun features include an open and rounded reception desk right middle of a lobby entrance, a pool table, express check –in, open snack bar area, video walls, casual meeting rooms that look more like yoga studios and a laundry room. What else does one need? 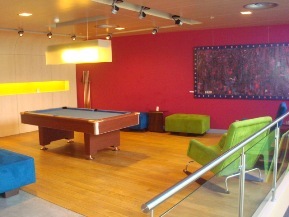 Aloft is a sister W Hotel with a little of that spirit at a much lesser price! !